Christopher Walsh is an award-winning sportswriter who covers the University of Alabama football program for the Tuscaloosa News. His honors include the First Amendment Award from the Associated Press Managing Editors, two Pulitzer Prize nominations, the Herby Kirby Memorial Award from the Alabama Sports Writers Association, and Enterprise Story of the Year from the Football Writers Association of America. 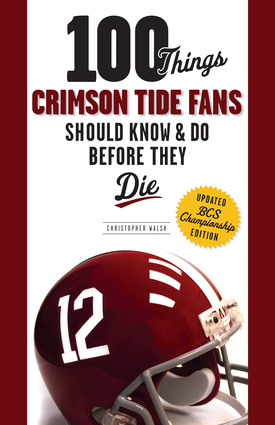 He is the author of Crimson Storm Surge: Alabama Football Then and Now, No Time Outs: What It's Really Like to Be a Sportswriter Today, Packers Triviology, Steelers Triviology, and Where Football Is King: A History of the SEC. He lives in Tuscaloosa, Alabama.